How to fix the "Load Fail" problem? If you use the advanced theme, the "Load Fail" problem may occur. 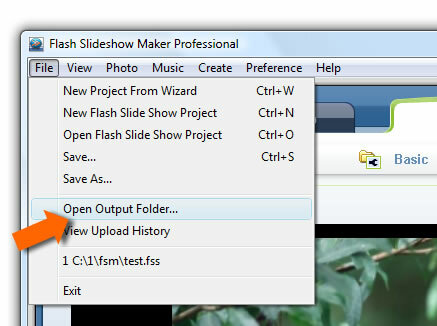 The generated folder of flash slideshow make with advanced theme are a set of pages, images, resized photos and flash movies with XML configuration files. 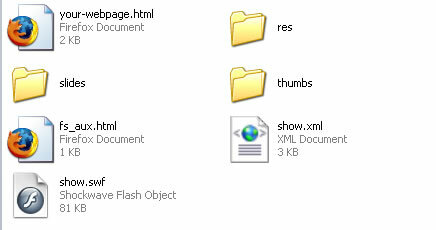 All these files are located in the Output Folder that you can open it by choosing File->Open Output Directory or click Open Output Folder button after publishing the slideshow. The following are something you need to pay attention. 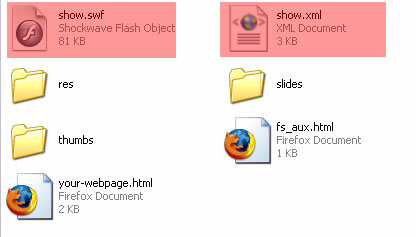 --You can only change the name of SWF, HTML and XML files. The name of other output files, such as res and thumbs, cannot be changed. 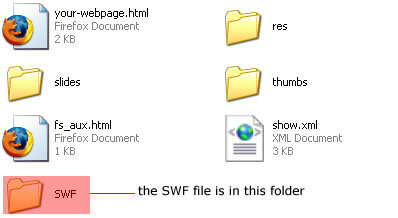 --The path of both SWF and XML file is relative to the path of your webpage HTML file. -- Please bear in your mind the HTML file in the output folder is a sample of the webpage with SWF slideshow and it can be replaced by the HTML file of your own webpage. Now, let's take a look at the code should be used for different file directory. 5. You can also use the absolute URL for both the SWF and XML file. The key to fix this problem is to asign the flash variable xml_path a correct value.